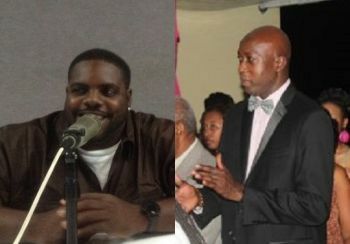 ROAD TOWN, Tortola, VI - With the growing voices saying that the controversial Minister for Education and Culture Honourable Myron V. Walwyn has done nothing under his Ministry for three years, another of his portfolios is under fire for inaction. 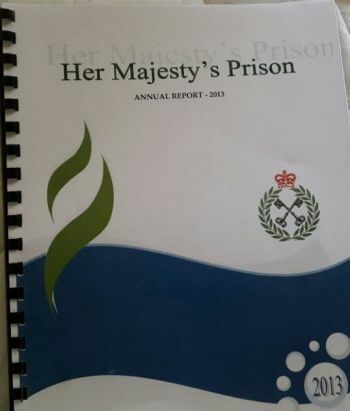 This time it is Her Majesty’s Prison (HMP). This information was obtained via the 2013 HMP Annual Report laid on the Table of the House of Assembly on February 12, 2015. The report stated that in 2013 the roofs of many of the building comprising the Prison compound had asbestos and had badly deteriorated over the years. Whenever it rains, the roof leaks. As a temporary measure, the prison staff used canvas to cover the areas that leak, the report stated. Another issue that is getting worse under the NDP Administration according to the 2013 HMP Report is administrative matters. The report called for additional suitably trained staff to ensure that the prison service serves the public by keeping in custody those committed by the court and minimize the risk of escapes and breaches of security. It appears that there are not even functioning hand radios at the Prison to increase communications among staff and response time to emergency situations and to prevent escalations, according to the report. On a recent Virgin Island Party (VIP) Radio Show Youth Leader, Master and Businessman Rajah A. Smith blasted the National Democratic Party (NDP) Government and labeled them the ‘do nothing government’. Mr. Smith, who is seeking the VIP nomination through its Congress to run At-Large in the 2015/16 general elections, told the public that “in fact, all we have gotten from the NDP for three long years is; we could not do anything for you in sports, in education, on sewerage, in health, in agriculture, in finding employment for youth, in bringing before you gun legislation, in fighting crime, fixing roads, bringing a better way of life for the 99% of you and in stimulating the economy because it’s the Virgin Islands Party’s fault”. However, Mr Smith, the VIP Ready Committee/Youth Arm President, brushed aside the excuses and the blame game of the ruling NDP and placed the blame squarely on their lap. He said, “my answer to the NDP and their supporters is you have failed the people because of your own incompetence, lack of vision for the country and that you spent more time looking out for yourself and the 1% than the rest of us”. He said he heard recently some chatter that the NDP is for all the people. According to Mr Smith, “that is rubbish…in fact the record is different, that is why they cannot run on their record”. He may have a point on this issue. Ask the Prisoners and the Wardens. He did not protect forbes from being removed from going unemployed?. LOOK AT WHAT THE VIP HAS COME TOO. THIS BOY IS A PUPPET ON A STRING FOR FRAZER, SOUNDS SO ILLITERATE. AND SOME OF YOU PEOPLE SUPPORT HIM. MY GOD!!! I do not see much difference between Myron and rajah….so none is better than the other. So stop talk what you don’t know. Read and remember, do your research. You mean you don't see any difference between yourself and rajah!!!!! if you had any intelligence you will be able to spot ignorance! Ha Ha you all better not go there as when I listen to them moo moo Like Alvera, Deloris and Myron in the house Mr. Rajah Smith sure has the edge over them. VIP will NOT WIN!!! You don't get it? You all support IGNORANCE and STUPIDITY! YOU WILL NOT WIN! Watch! I totally agree, someone needs to sit him down. He is making an idiot of himself. I can't imagine being bought for $2.00, he is an embarrassment to the country and his family. Keep Forbes out of your nonsense please. Where is the Love for the prisoners Myron? Show me a person more illi....te than Rajah and I will show you a blind man that can see..You VIP supporters so simple minded..gosh man!! Poor Rajah got his A** toasted when he couldn't stutter up a response when asked what he'd do after criticisizing the Ed minister, so now he switches targets to prison's? Grow up, son. NDP supporters must be beaming with pride with the only seat they say they have is walwyn and is the one guy who has performed the poorest! I'm not a Rajah fan but this guy Myron is sure ain't in his league. The Prison, Police and Customs are under the portfolio of the Governor, the ministry deals with social welfare of the prison. Rajah will never be chosen by VIP congress to be an At-Large candidate which he is seeking. If they do chose him then it tells us all we need to know about the VIP. If you think we have jokes now, wait until the young man gets up on the podium with his noise. I hope they also have debates as a part of the campaign this time around. I am for the debates. Half of them aint ready for the pressure. Just tell me the difference between Archie, Myron, Alvera, Deloris and Rajah???? Any takers??? u all think prison a bed a rose unuh lucky unuh neva did a look up on the starts at nights..ahahaha u all too comfortable up there ...send some of those rats from pockwood pond up there to dine with them too.. The VIP has a process-CONGRESS to select only people that are capable of winning. Not just any fool and self centered ppl who throw themself out there to humiliate themselves, or is friends with Lorna or Ronnie. No BVI voter in their Right Mind would ever consider giving the NDP c.......s their VOTE every again that was their last remnant. can't spell minister feeling toasted? All Mr smith has done is make a bunch of negative comments. Does he think by constantly criticizing the current government that he is a shoe in at next election??? Does He think because he from here and have a "indigenous " last name that's all that is needed to be a leader. Mr smith what have you done ? where did you study ? What are your credentials? Why should I trust you to lead my country ? What will you do differently ? You do feel like you have to tear down someone to make yourself seem larger? Please go and sit down.